Somebody in the Marketing Department is charged with creating a campaign. And oh boy, OH BOY, they absolutely hit one out of the park ... maybe they come up with some magical contest coupled with free shipping and 20% off in the middle of January, 2010. For the next week, sales go BONKERS! The marketer is celebrated. She's nominated for a company award, and at the quarterly meeting, she's presented with $800 and a free plane ticket valid for travel anywhere in the continental forty-eight states. Five weeks later, she's celebrating her genius at Hilton Head, while you're grinding through the analysis of one of an endless number of non-descript e-mail campaigns that are lucky to cause one in seven-hundred customers to purchase. We're a short-term society. We demand sales, NOW, and we reward people for what they've done lately. Our businesses, however, thrive when we fertilize the customer file. 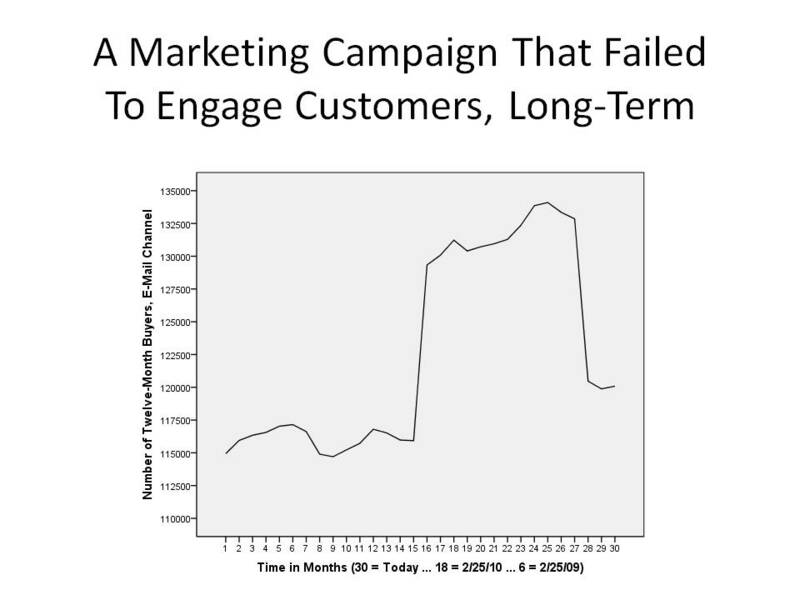 The truth is that many of our marketing campaigns fail to "engage" the customer. 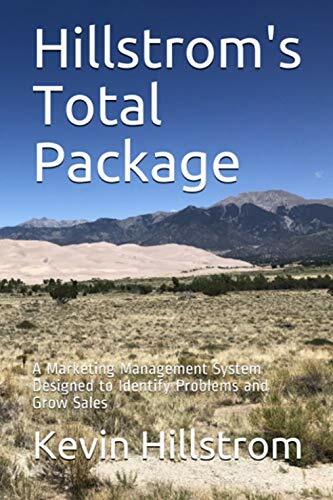 In other words, when we measure the success of a marketing campaign, we take a "short-term" approach ... we simply ask if an e-mail marketing message or catalog or social media effort cause the customer to buy in the twelve, twenty-four, or forty-eight hours after the campaign. Look at the image at the top of this post. This is a "rolling-twelve-month" buyer analysis of the e-mail channel within a business. We construct the query in parts. Count all customers who purchased via e-mail from 1/1/2009 to 1/1/2010. Then count all customers who purchased via e-mail from 2/1/2009 to 2/1/2010. Then count all customers who purchased via e-mail from 3/1/2009 to 3/1/2010. Repeat this process after every month, through current. Plot the count of twelve-month buyers within the channel. You end up with a graph similar to the one at the start of this post. 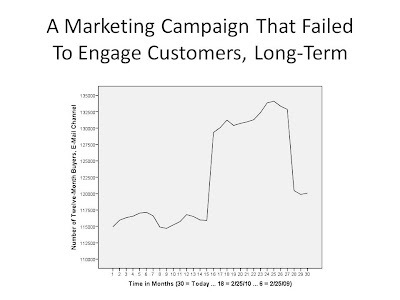 When a marketing campaign fails to "engage" the customer, you'll see a trend like the one illustrated in the image at the start of this post. At month sixteen, the company ran a special e-mail marketing campaign, and customers LOVED IT ... twelve-month buyers increased by nearly 14,000. Nine in ten Executives would say that the campaign "worked". One in ten Executives would ask for a rolling-twelve-month buyer analysis a year later. This rare set of Executives are rewarded with a very interesting finding! Look at what happens in month twenty-eight ... the number of twelve-month buyers decrease by more than 12,000. In other words, the vast majority of customers who purchased from the marketing campaign did not purchase again from e-mail, falling off the e-mail twelve-month buyer file. 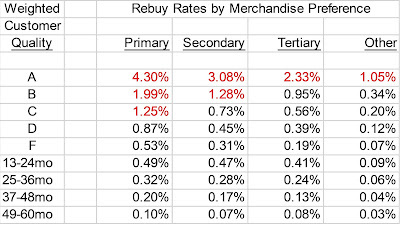 Now, granted, these customers may have purchased from other channels, so it's wise to run this analysis for your total buyer file, and for all micro-channels within your business. This is common. Marketers are rewarded for short-term efforts. Our job is to analyze the long-term impact of our decisions. Long-term, this campaign failed, because it harvested sales that did not translate into long-term business. Your post is pretty illuminating and practical,I completely agree with the above comment. Thanks for the sharing.Will you share more about it? I just want to know more.You are very talented.I guess, this site would be my farorite one. Thank you again!! !